Designed to LEED Silver standards, the new hospital is a 1.6 million square foot, state-of-the-art facility with a full range of health services including complex continuing care, rehabilitation, renal dialysis, acute inpatient care, maternal child care, inpatient and outpatient adult and child adolescent mental health and secondary and tertiary level programs. 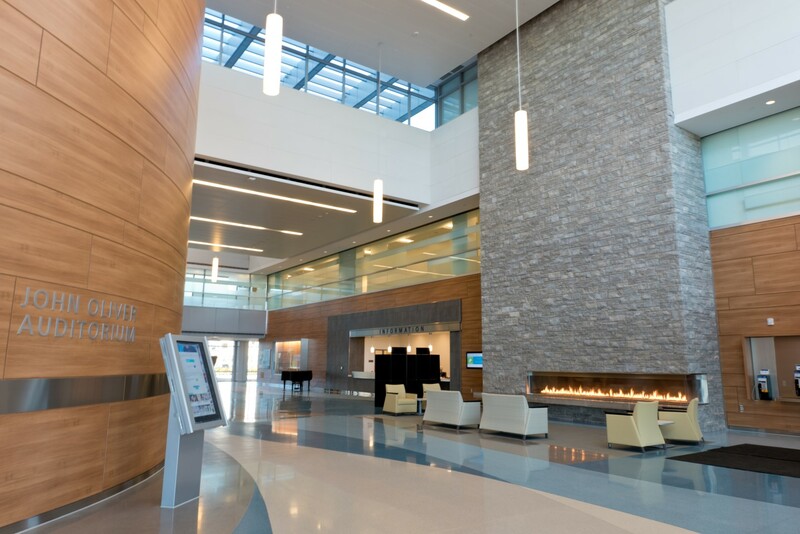 The design of the facility is patient-centered, family- centered, and staff-focused. It provides a natural and therapeutic environment for patient and family comfort, boasts design features to support and improve staff functions, and is designed with flexibility to accommodate new technology or best practices as they emerge. The Emergency Department is 45,000 square feet, and designed to provide preeminent emergency and urgent care. 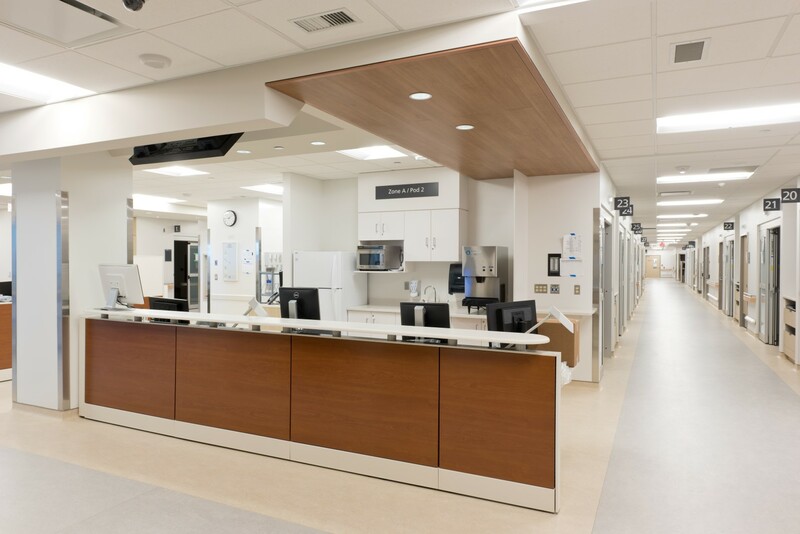 From the initial waiting area, patients will be quickly triaged into specific areas of care, such as: trauma and resuscitation, rapid assessment, urgent care, minor treatment, or emergency psychiatric unit. The department is planned to ensure improved operational efficiencies, with resultant patient outcomes and wait times. It breaks away from the traditional pod concept of organization, in which each care area is segregated from the other. 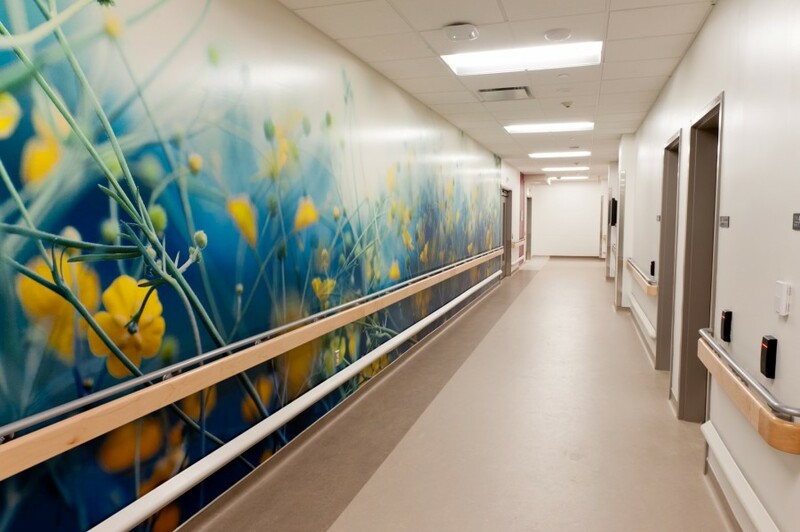 The new design reflects a more linear and integrated approach to managing various patient types, while maintaining visual and acoustical connections among staff from all areas of care. The department is designed to expand and contract in response to patient volumes and staffing availability. The traditional, large, patient-waiting area found in most hospitals has been reduced by moving the actual patient-waiting space to the specific areas of care. This places the patient immediately adjacent to clinical staff allowing for enhanced monitoring of a patient’s condition, and rapid response to the movement of patients through the process. Additionally, patients showing symptoms requiring specific infection control protocols can be identified and isolated in appropriate environments. The emergency department does not, of course, function independently of the total patient diagnostic and treatment programs within the new hospital; it is designed to allow efficient movement of patients into adjacent programs, such as: diagnostic imaging, surgical suites, intensive care and inpatient beds. The necessary circulation systems in place to accommodate these movements ensure patient privacy, patient dignity, and competent infection control measures. 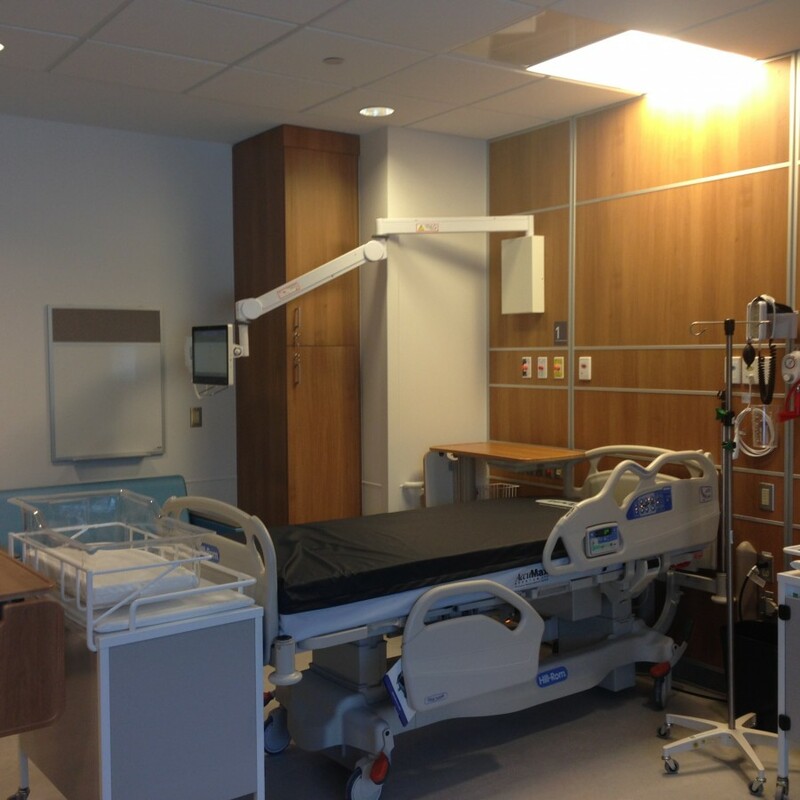 Eighty per cent of inpatient rooms are designated as private, or single-use, and are designed with patient care and recovery in mind. This provides privacy, opportunities for family or loved ones to stay overnight, and enhanced infection prevention and control. Personal entertainment systems to provide the opportunity for patients to stay connected with their social network and support system. Family space at bedside and lounge, including a pull-out bed. Large windows positioned so patients are able to see the exterior areas while lying in bed. Patient washrooms that accommodate wheelchairs – and every patient room has a roll-in shower in a private washroom. Built-in storage and staff work areas at the entry to patient rooms that improve: staff efficiency, infection prevention and control, and connectedness among patients and staff. 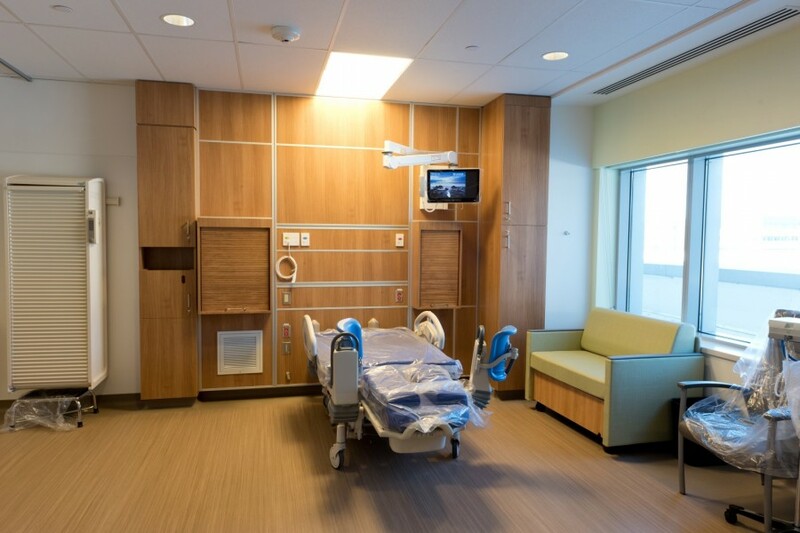 Touch-panels in the single-patient rooms that allow patients to control room temperature, lighting and any meal requests, including ordering for family or friends staying with them. The Maternal / Child program locates all aspects of the program in a single floor plate. Prenatal clinics are adjacent to birthing and postpartum units to make sure patients have an early understanding of location within the facility and the most direct routes for access when the moment arrives. A paediatric program is located on this floor as well, but is arranged to create separate, but connected, functions. The design reflects the privacy and security needs of postpartum and separation of infection issues associated with a peadiatric population. Despite the size of the new hospital and the critical relationships among clinical spaces, the design remains focused on using daylight and views to the exterior as key elements for way-finding, while making the necessary travel routes a positive and enjoyable experience for patients, family and staff. The inclusion of courtyards that penetrate the large clinical footprints ensure that access to daylight is achieved in patient / family waiting rooms. All waiting areas have carefully chosen colour palettes, decorative screens and seating arrangements that establish a scale that is comfortable in layout and reduces the feeling of being overwhelmed and intimidated by the size. Self check-in kiosks and workstations located in the main entrance and clinical areas allow for patients to register quickly. Way-finding was integrated into the design of the facility from the beginning of the planning. A simple concept of a central stream – Sixteen Mile Creek, with tributaries that direct patients and families to key destinations – was employed. The floor finishes and lighting reflect this metaphor and, along with changing views to the exterior, provide an intuitive way-finding response. This makes navigation simple and direct, despite the immense size of the building. Static way-finding signage is essential and reinforces and supplements the journey. Easy access and separation of traffic for emergency vehicles, public transit, and hospital staff, with plenty of parking for patients and visitors close to multiple entrances. Wireless and new technology replaces individual pagers and public paging to provide a quieter environment. Places for art have been carefully selected and will see increased opportunities and additions over time.